Spent a good amount of time on the nose tonight, very happy with the way it came out. 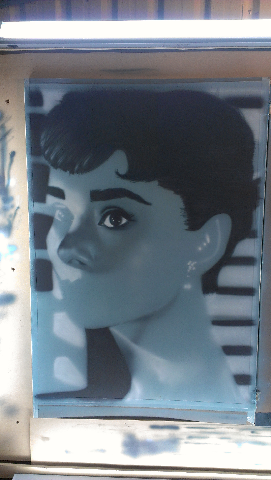 Looking at the previous version, I feel like I am leading more from redoing the Audrey piece. I think having read the notes again and doing the excersises that were ment to be done before I even started each section. I now feel as though it was rushed or there wasn't enough teaching time spent with me during the lessons, I will mention that when I start again middle of October. I am looking forward to finishing this piece off, so I can start on Frank. I find Audrey not exciting even though she is a beautiful woman, it might also be that I feel that I am not doing the image the justice it deserves. I am going to work on the ear next, I am more confident that I will paint it correctly, also I have to find the side of a skull that I can use as a reference for the small piece I am doing.